Address: Mato, 1, Puerto del Carmen (Lanzarote), Islas Canarias. 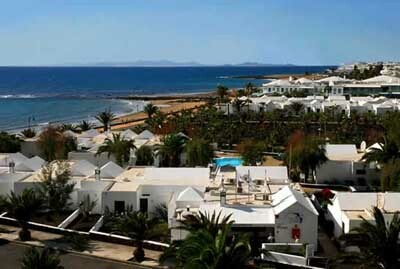 Apartamentos THe Las Gaviotas, on Matagorda Beach, Lanzarote, offers Atlantic Ocean views and 7 outdoor pools. Bungalows have a private garden terrace with patio furniture and sun loungers. All Apartamentos THe Las Gaviotas bungalows have a living room with an LCD flat-screen TV. There is a fan and a small heater. Some bungalows offer air conditioning. Each bungalow has a kitchen with a ceramic hob, fridge, microwave and toaster. There is also a kettle and a coffee maker. There is a private bathroom with a hairdryer. Las Gaviotas Lanzarote’s restaurant serves buffet meals, and there are 2 poolside bars. There are shops and a supermarket 50 metres away, and a bus stop 200 metres away. There is a 24-hour reception, and you can hire a car or bicycle. The complex is 3 km from Puerto del Carmen, and Costa Teguise Golf Course is 15 km away.